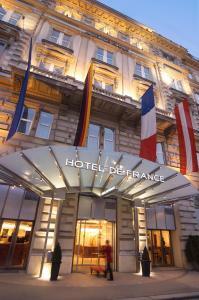 Centrally located on Vienna's elegant Ringstraße boulevard, Hotel de France Wien offers a restaurant, a bar with piano music, free 24-hour gym access, and free WiFi in all areas.The Schottentor Underground Station (line U2) is only 50 metres away. Traditional Viennese specialities are served in the restaurant No.3. In summer, it features a sidewalk café. Japanese dishes can be sampled at the Daihachi Sushi Bar. A large breakfast buffet with smoked salmon and sparkling wine is served on the restaurant’s upper floor. The de France’s stylish Atrium Bar features live piano music and offers views of the glass-covered atrium. The bright rooms feature free wired internet access, satellite TV, a tea/coffee maker, and an elegant bathroom with bathrobes, slippers, and hairdryer. All public and private areas at Hotel de France are non-smoking. There is an underground car park with valet parking and a souvenir shop at the Hotel de France, and a cinema showing English-language movies is in the same building.